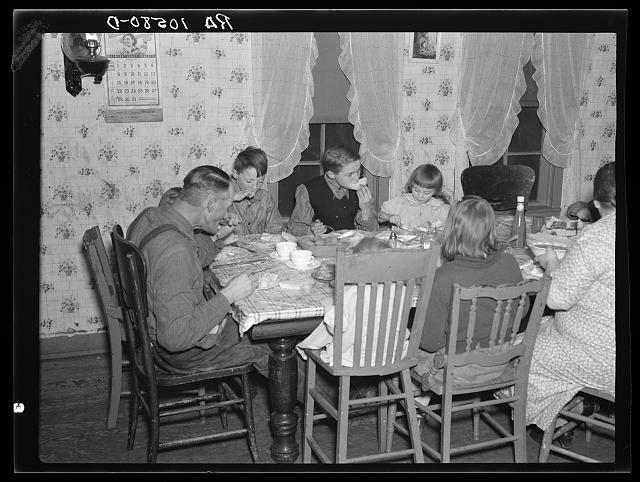 Tip Estes and his family eating dinner, 1937. Photographer: Lee Russell. Library of Congress, LC-USF34- 010580-D [P&P]. The success of various parenting styles, from helicopter to free-range, is often debated. A new study by researchers at the University of Virginia finds more fundamental differences in family culture that are shaping today’s children. The Culture of American Families Project—co-directed by James Davison Hunter and Carl Desportes Bowman at the university’s Institute for Advanced Studies in Culture, and funded by the John Templeton Foundation—has identified four “home cultures” that make up 87 percent of families with school-age children: the Faithful, Engaged Progressives, the Detached, and American Dreamers. The data is based on a nationwide survey of 3,000 parents as well as longer follow-up interviews with 101 respondents. “Though largely invisible, these family cultures are powerful, constituting the worlds that children are raised in, and may well be more consequential than parenting styles,” [Davison] said. via U.Va. Study Identifies Four Family Cultures in America | UVA Today. “The defining feature of the Faithful is that ‘morality’ is understood to be received from a divine, external source, whether within a Jewish, Christian, or Muslim tradition,” the report states. Faithfuls tend to be politically conservative (51 percent Republican versus 13 percent Democrat), strongly oppose gay marriage, and attend religious services weekly. They believe their own children share their moral codes, though almost half of them report an overall decline in American standards. They are the least religious of the four cultures; two-thirds say religion is not important to them. Although they hesitate to punish their children, 93 percent say they “invest much effort in shaping [their] moral character,” hoping they will grow into adults who treat others well. They typically let their teens have access to birth-control information at an earlier age. They have lower educational goals than other groups, lower annual incomes (one quarter of their households earn less than $25,000), and are less likely to vote. They are also less pleased overall with their own parenting experiences (fewer than one-third say they’re “very happy”), and few believe they can have an influence on their high school-age children (29 percent). This group also has more minority representation than any other (64 percent). Their annual incomes are not much higher than the Detached, but they have high aspirations for their children. Sixty-eight percent of Dreamers say they invest heavily in protecting their children from negative social influences, compared to 33 percent of the Detached. Interestingly, while most of the parents surveyed (64 percent of all respondents) see a decline in American family life since they were children, they tend to report that “their own children are actually doing extremely well.” For example, according to parents, 82 percent of their own children are above average (A or B) students. “This may fall short of Garrison Keillor’s ‘children of Lake Wobegon,’ but not by much,” the researchers observed. Parents also seem to underreport alcohol consumption, saying that just 10 percent of their own teenaged children ever imbibe. In contrast, 72 percent of high-school students have reported trying alcohol, according to the U.S. Centers for Disease Control and Prevention. “Parents may be so emotionally tied to their children that they lose the capacity for clear assessment of their children’s troubles,” the report states. This entry was posted in families, sociology and tagged American families, culture, morals, religion, research, sociology, Templeton Foundation by Susan Frith. Bookmark the permalink.